BYB: You're from Australia. So tell me how a guy like you becomes a die-hard Yankee fan? Charles: I played softball at school during the 70's and back then we didn't have the coverage we do today. There was no Internet, cable TV and I learned about baseball and the Yankees through my Physical Education teacher at school. He had been to Yankee Stadium and told me all about the history of the Yankees and I was hooked. I was 10-11 years old at the time. BYB: Who was your favorite Yankee growing up and why? 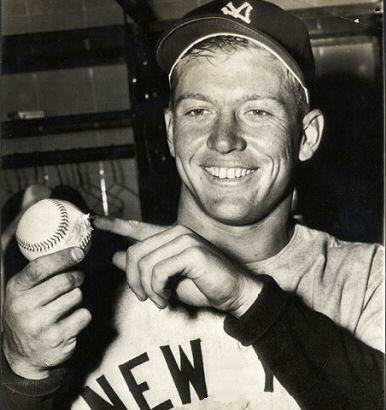 Charles: The only information I could get was through the library and after reading about all the greats, Mickey Mantle's achievements blew me away. To achieve what he did with all those injuries, he became my favorite. BYB: Joey, tell me who you admire the most in pinstripes today and why? Joey: It easily has to be Derek Jeter. He represents what I believe being a Yankee is all about. His will to win, his ability to make a play when the team needs him and the way he Captains his men. No play is ever out of reach for him. We need a hit? He gets the hit. Need an RBI? He gets it. He’s my modern day Mickey Mantle. BYB: How many times have you been to Yankee Stadium and what do you think about the new ball park? Joey: I've been 3 times, all in the same 2012 trip. I have witnessed all my current idols. Jeter, CC Sabathia, Robinson Cano, Curtis Granderson, Mark Teixeira, the list goes on. 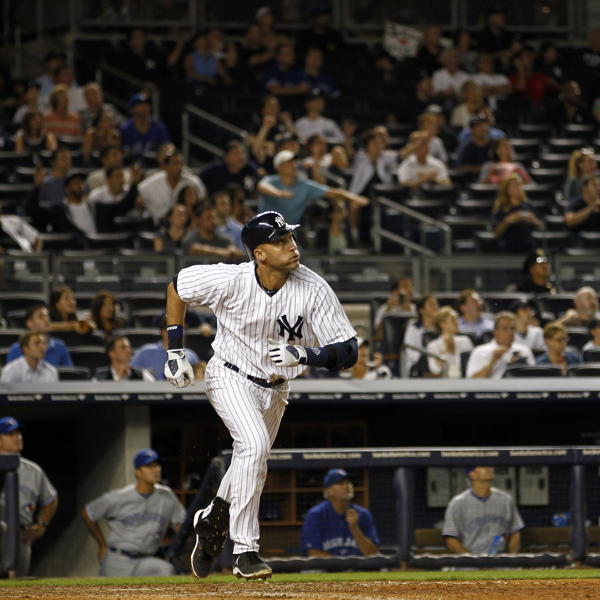 My only regret was that Mariano was injured. However, can't ever forget and will always be able to say that I was there the day Andy Pettitte returned. We may have lost that game, but seeing him back in the pinstripes was a sight I’ll never forget. Charles: Well, it's a lot easier now. I subscribe to MLBTV which gives us access to all Yankee games. With the time zones, most of our games are on between 1AM - 9AM Sydney time. During the weekdays, it's hard to wake up that early and then get to work, so I try to not get the score and watch the highlights when I get home, but on the weekends we are watching the games live. BYB: If there were 3 Yankees you could have a pint with and just talk baseball, who would they be and why? They can be living or deceased. 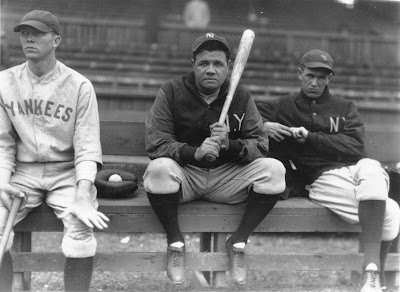 Joey: Without fail, Babe Ruth, Mickey Mantle and Derek Jeter. 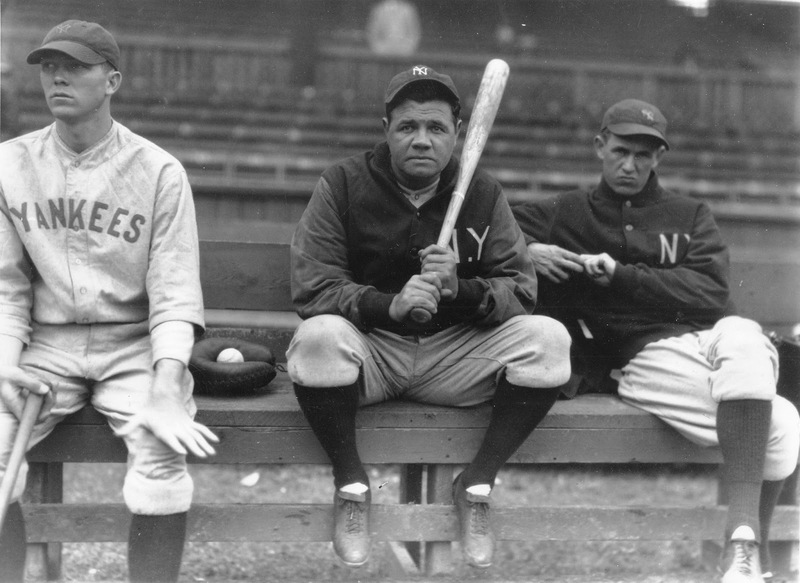 3 of the most famous names in any sport and the reason greatness is a key ingredient in Yankees folklore. I'd want to ask Babe what it felt like being the reason baseball is where it is. I'd ask Mickey if he thinks he could play in today's game and vice-versa with Jeter. BYB: Are there a lot of Yankee fans in Australia? Charles: A lot of people know about baseball in Australia now and almost any sports fan knows the Yankees. Our cable networks show at least 6-7 games a week live. I haven't come across any Yankee “fan base” in Australia, but you can be assured that everyone I come across knows about Bleeding Yankee Blue. 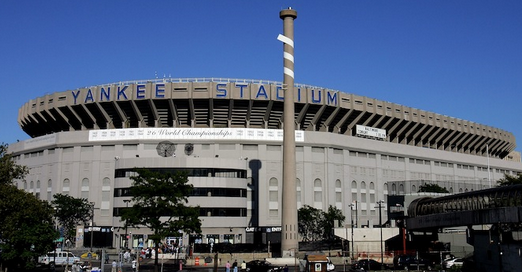 BYB: Explain the first time you came to New York City and then walking into Yankee Stadium. Joey: The first time I visited New York was 2007 with a mate of mine. The first visit to Yankee stadium, like I said, wasn't until 2012. I was 27 (ironically we've won 27) as all my previous trips were during the off season. It actually turned out better that way because my first memory, and a memory that will stay etched with me forever is walking into baseball’s cathedral with my father. Whether you're 7 or 27 years old, if you're a fan of baseball, there's nothing better than going to a ball game with your dad. We were playing the Rays and the weather was less than inviting, rainy and cold. But that was not going to stop us! I would have sat in snow and watched all night if I needed to. 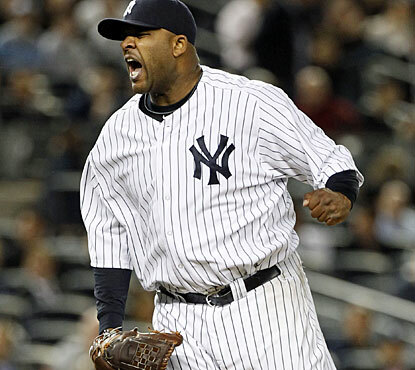 Sabathia was pitching and we walked away with a win that night. Ibanez homered and I’ll never forget that either. My first home run live! I think the new park is amazing. We sat in 3 different seats each game and the view was amazing. We were close to the action and surrounded by the euphoria of the Yankees spirit. It was very loud and very New York… Just the way I love it. BYB: Charles, tell the readers about our meeting. I did in my piece meeting you and Joey, but give them a taste from your perspective. 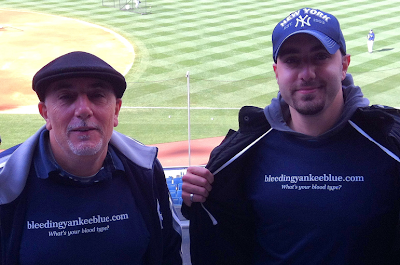 BYB: What can you tell people that have never read Bleeding Yankee Blue before? Charles: If you want a true fan’s perspective of how the team is travelling and you don't just want to read the media watered down version, then BYB is the place to get real Yankees news and opinion. It's by Yankee Fans for Yankee Fans. BYB: What in your opinion makes Bleeding Yankee Blue an important part of your life? Joey: The connection it gives me to the Yankee family on the other side of the world. Whether it’s the United States, Europe or anywhere, it brings all us Yankee fans together. The articles are a must read for me every day. They're brilliant and always related to topics worth discussing. I can't get enough. Friends for life? I'd say so. I'm glad I got to do this with Joey and Charles and I appreciate them taking the time. Thanks guys... Go Yanks! !